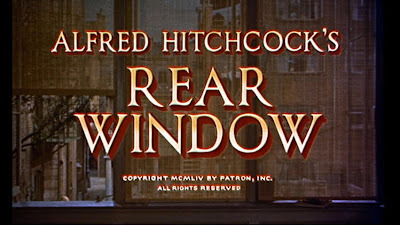 I recently read somewhere that Alfred Hitchcock's 1954 thriller Rear Window acts as a metaphor for the moviegoing experience. What the what? But wait for it, it actually makes a whole lot of sense. His films keep coming up on this list (North by Northwest already screened, Psycho and Vertigo are near the top) and I think I set myself up to think they'll be more action-packed. 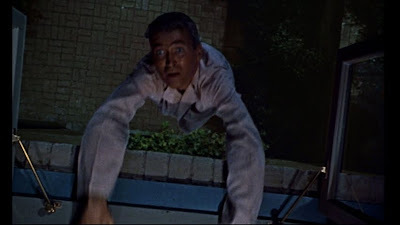 "It's Hitchcock! It's a thriller! So much action!" ... especially when many movies on this list go by without much in the way of spectacle or thrill. But what I keep forgetting is Hitchcock's mastery comes from making you wait. Cuisine: I don't think I ate anything. Trying to shed that winter weight. 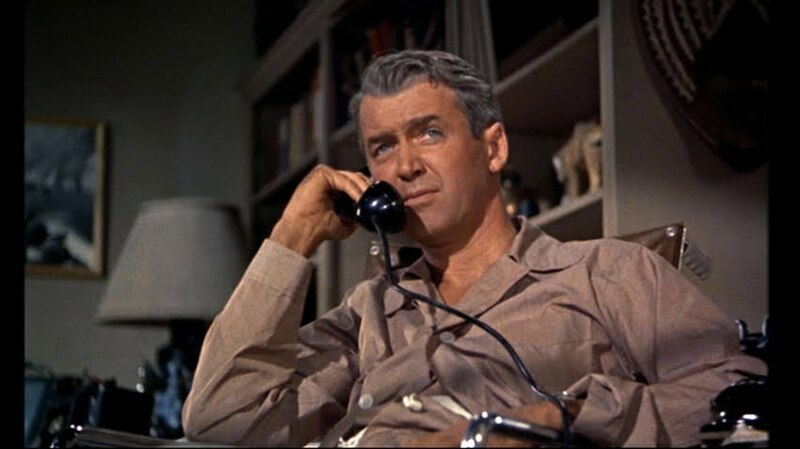 Famed photographer L. B. Jefferies (Jimmy Stewart -- Steph and I can do terrible impressions of him) is holed up in his Greenwich Village apartment after suffering an injury (what it is, we're never sure) during a shoot. One leg in a cast means he's confined to a wheelchair, and in an apartment without elevators, he's stuck. The apartment itself even has stairs up to the door, meaning he could not get out in a hurry ... or lock the door, which would come in handy later. 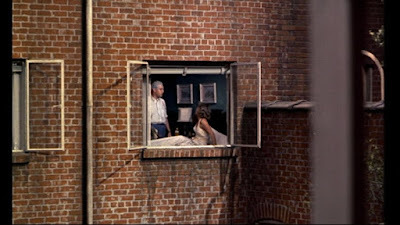 Bored after several weeks, he slowly becomes a Peeping Tom, doing some recreational spy work on his neighbors across the courtyard. "I think there's going to be trouble around here." The lives of most of his visible neighbors -- the married couple to his left, the ballerina in her underwear, the lady with the dog, the songwriter to his right -- are unremarkable and mundane, but he's intrigued by a salesman across the way, a man whose name, he comes to learn, is Lars Thorwald (Raymond Burr), whose bedridden wife suddenly disappears. Jeff's "amateur sleuth" work, and his subsequent accusations of murder, do not impress or especially interest his cop buddy, Lt. Doyle (Wendell Corey), but they do finally light a fire under his nurse (a wonderful Thelma Ritter) and his supah-beautiful girlfriend Lisa (Grace Kelly). 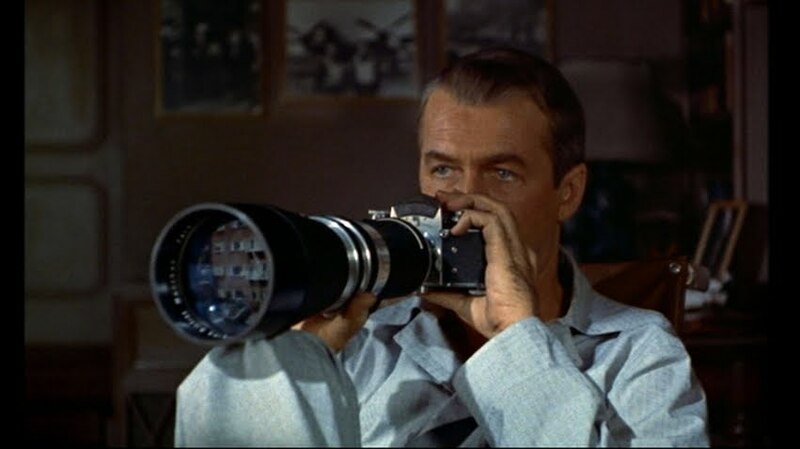 I don't want to give too much of the plot away, but suffice it to say most of the plot points are revealed through minutiae that Jeff perceives through his binoculars and the epic lens pictured above. In this way, Jeff and his confidants seem to represent the audience, with his apartment's rear-view window acting as a movie screen. 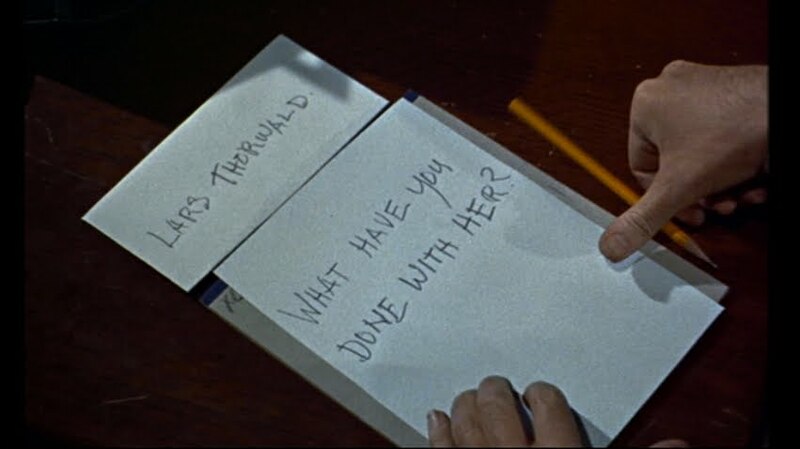 Through visual clues, Hitchcock asks us to keep up with Jeff's thought process, linking these bits of information together to solve a mystery. Miss Lonelyhearts ventures out for a night on the town. The main action of the film is mundane at first glance, and in fact almost plays as a silent film. There's very little scored music, only incidental tunes floating in from different apartments, and background noise like birds or traffic. It's easy to tune out of this, and dismiss the film as being uneventful, but Hitchcock's hand is in every shot, carefully crafting it. Each of those compartments have such clearly defined action, even if it seems like nothing is happening. After a while Lisa, imagining the worst, and Stella, ever practical, wander out into the courtyard to investigate, and the fourth wall is broken. Jeff, who couldn't quite commit to the idea of a relationship with Lisa, finds his love for her ignited when she becomes a part of the movie he's watching. 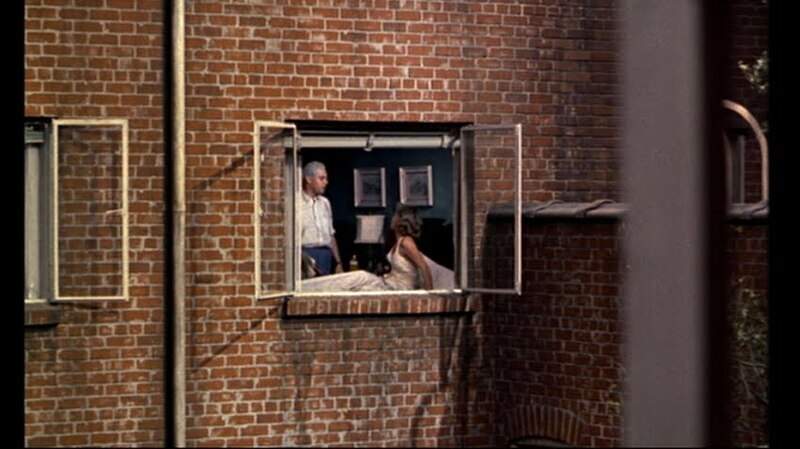 There's something innately sexual about being a Peeping Tom, about watching without being watched, and seeing something we shouldn't. The filmgoing experience is much the same -- it's the nature of eavesdropping, and perhaps why we loves the movies so much. Involving his cronies in the mystery brings the film to a nail-biting final act. See what I'm talking about with those compartments? These three windows so perfectly define and separate the three elements of this part of the story, perhaps as a comment on their separation from each other and from us, the audience. ... through the window behind which Jeff has been so comfortably perched. Now he too has become a part of the action. An intense and complicated metaphor, I know, but I think it all makes sense ... right? 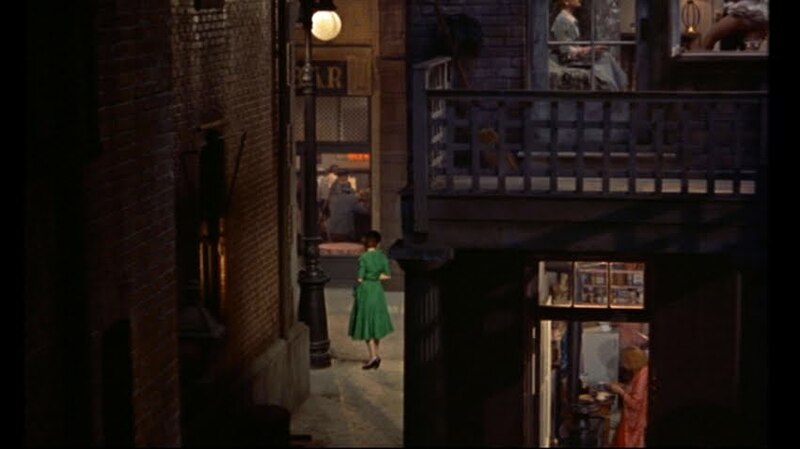 Again, the climax of the movie takes place sans musical score, which adds to the silent-movie feel. 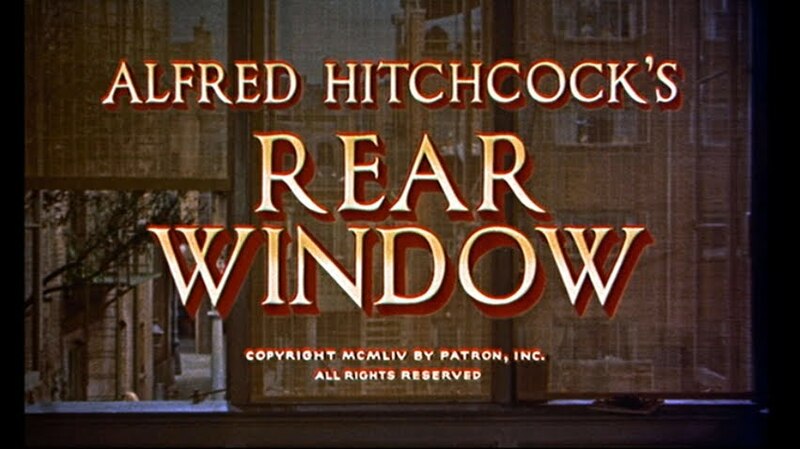 A very different film from North by Northwest, to be sure, but Rear Window has those trademark Hitchcock touches that I've come to love, plus it functions as a larger story about why we love movies. What more could you ask for? Next up: Marlon Brando and Vivien Leigh battle it out in Tennessee William's masterpiece A Streetcar Named Desire. 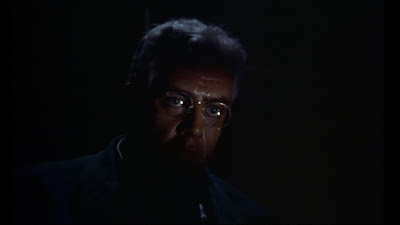 Does Alfred Hitchcock ever appear in this film, like he does in some of this other films? I cannot remember seeing him when we watched it. 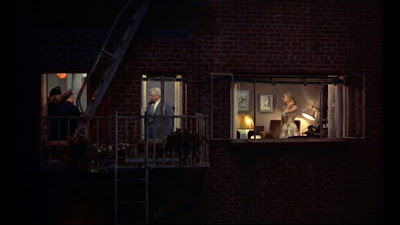 He does -- he's winding a clock in one of the apartments on the right, the one where the songwriter lives.